This edited article about echinoderms originally appeared in Look and Learn issue number 785 published on 29th January 1977. This unusual group of sea animals forms a very varied collection, certainly as far as shape is concerned. But they all have five radiating arms, like spokes of a wheel leading from a central hub, and they all have prickly skins. The Greek word for this group is echinoderms – prickly skins! The sea urchin, sometimes called the sea chestnut because of its resemblance to the horse chestnut, is not an obvious member of the group. The prickly spines are easy to see – and to feel should you step on one – but its five-arm structure is not so apparent. However, if the prickly armour is removed its kinship with the starfish is quickly seen, for it has five tube-like feet and five sets of shells forming its skeleton. It also has a complicated arrangement of five sets of teeth with which it scrapes its food from rocks. The urchin moves slowly on its tube feet in search of seaweed, often returning to the exact rock from whence it set out. In time the rock underneath becomes deeply worn, for the ‘jaws’ of the animal, being on the underside, rub away hollows in the rock. The spines are enough to keep most attackers away, but it also has a second line of defence. The starfish for example, is not deterred by the prickles and when the sea urchin feels itself being attacked by one of these creatures, it lays back its spines and leaves the skin bare. The starfish stretches out an arm to draw the prey into its mouth – but quickly withdraws, for a series of minute poisonous stings scattered over the urchin’s skin punctures its arm. The scene is repeated until the starfish eventually gives up. Sometimes, however, the starfish patiently pulls out all the stings – and the urchin’s end is near. The stronger and braver fishes eat sea urchins, and they are a favourite with the sea otters. In many parts of the world, the eggs are regarded as a delicacy. In Mediterranean countries, they are sold on the streets with vinegar added, and in the West Indies they are served for breakfast, cooked like scrambled eggs. The sea cucumber is another echinoderm which does not seem to ‘belong’. It does not have a hard skin and it does not have any spines. But an examination of the body reveals five double-rows of suckers. As the name suggests they are shaped like cucumbers – a long soft body with the head at one end. The mouth is ringed with tentacles. Sometimes these are bushy or feathery, used for catching tiny plants or animals swimming just off the sea bed. Sometimes they are like little fingers. Using these, the sea cucumber shovels mud and sand into its mouth, licking each tentacle in turn like a child licking its fingers sticky with jam. In the East, sea cucumbers are collected in vast quantities, boiled for twenty minutes, then dried in the sun or smoked and made into a thick soup. The starfish is the most typical of the echinoderm family. Everyone recognises these pretty creatures with the five perfectly symmetrical arms which give them such an elegant appearance. The starfish moves by means of hundreds of tiny suckers or tube feet on the underside of its arms. It attaches its suction discs to a rock, then retracts the arms and pulls itself slowly along. In this way, it can climb vertical rocks or up the walls of a glass aquarium. It can move across the roof of an undersea cavern. And should it be turned on to its back it can stretch out its suckers, attach them to a firm surface and slowly peel itself into a normal position. Starfish live almost entirely on oysters and mussels. They are such gluttons that when they gather in large numbers, immense damage is done to the oyster and mussel beds. When an oyster senses the approach of the starfish, it promptly closes its two shells, pulling them together with a powerful muscle. Anyone who has tried to prise apart the shells of an oyster knows just how strong that muscle can be. But the starfish is not put off. It wraps its arms around the oyster – and then begins a fantastic tug-of-war! The result is the same every time. The oyster is no match for the relentless pull of those five gripping arms. Slowly the shells come apart – and the battle is over! Then an extraordinary thing happens. The starfish puts its stomach out through its mouth, thrusts it into the open shell, and digests the edible part of the oyster on the spot! It then swallows its stomach again, and, after sucking out the juices that remain in the shell, sets off in search of another victim – and another tug-of-war. No less greedy is the brittle star. It is obviously related to the starfish although its does not have suckers on its five slender arms. Instead it moves by wriggling its arms in a sinuous snake-like manner; it is, in fact, sometimes called the serpent star. 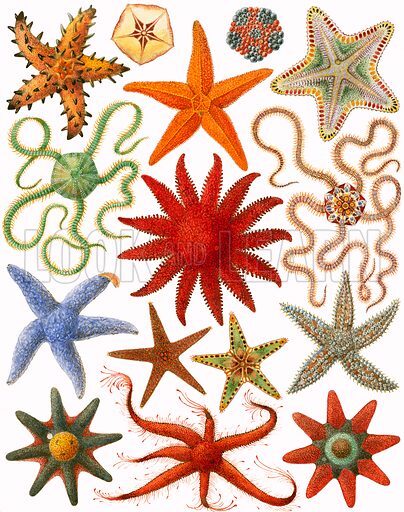 Another difference is in the mouth which, although placed in the centre of the underbody like the starfish’s, has a tooth-like edge which can chew hard-shelled creatures and grind their flesh to pieces. The brittle star is a creature of the night, hiding under stones or seaweed during the day. Although it is a clumsy mover, it can travel faster than a starfish. Sometimes it even swims through the water using its arms in much the same way as a human. The arm breaks off very easily, but just as easily grows again. And the brittle fish uses this knowledge to help it do a “disappearing trick”. When it is attacked it will deliberatley break off an arm in the hope that this will occupy the enemy while the brittle fish lumbers off. Unfortunately this ruse does not work too successfully, and the brittle star is eaten by many kinds of fish.